After a couple years of stability, we recently decided to tweak our allowance system (again). The reason for lumping short term savings in with spending money was to let the kids decide whether (and how much) to save for bigger ticket items, as opposed to frittering their money away on smaller, more immediate purchases. All in all, this has worked quite well. Of course, we also give the kids an opportunity to ‘upgrade’ spending money to their savings. We call this our 401(kid) plan, and for every dollar they decide to move from spending to savings, we match it with a dollar of our own. Their savings accounts are held as joint accounts at ING Direct, such that we can access everything under a common login. This system works quite well, with one exception… We’ve found that it’s often difficult to keep up with a weekly allowance payment, such that we wound up giving multiple weeks at a time less frequently. While the same amount of money was getting doled out, it was far less consistent than we had intended, and it often left the kids unsure of how much that had. To rectify this problem, we’ve tweaked things a bit more. This time, we left the 60/30/10 distribution unchanged, but have opted to move to monthly payments. So now we sit down on the first weekend of every month and settle up. The biggest change here aside from the frequency is how we figure the amount. Instead of paying $0.50/week per year of age, we now pay $3/month per year of age. This works out to a decent raise for the boys, though it’s still far from extravagant. And the decreased frequency of their allowance payments means that they have to budget a bit more to get through the month. The other recent change is that our youngest is now three year olds, which is the age at which we start paying an allowance. For him, this means getting $9/month. Have you considered figuring in a portion to set aside for taxes? I believe children need to be taught in the exact manner in which they will soon face as adults. Now they don’t really have to pay the taxes to the gov’t, but shouldn’t you consider taking a portion out for taxes in order to train them more precisely regarding finanaces? In reply to Aryn, we also use “enforced” charitable giving. While the recipient of the charity is a choice, the ACT of giving is not. One thing to remember, and I believe it is the reason that allowance discussions can become inflammatory, is that allowances are small representations of an individual’s/couple’s financial ethics and personal values. When we teach our children about money through the use of allowances, we pass on our beliefs and values as well. In the instance of compulsory charity, we (my husband and I) give our children the message that we expect them to take care of others as a natural part of their life. As our children got older (we have 3 teens and a college sophomore), they questioned this expectation, and that questioning provided opportunities to discuss our values and how those values are represented by our actions. For example, we wanted our children to learn responsibility and good budgeting skills. Therefore, once they reached a certain level of maturity (about 10 years old for one child and around 12 years old for the others), they received a “raise” in their allowance but were expected to budget money for most clothing expenses. We continued to cover 2 pair of tennis shoes, 1 pair of sandals, and one pair of dress shoes plus a new winter coat each year (all expensive items) until they stopped growing. This past year, our younger son, a high-school sophomore, received another “raise” to cover lunch expenses. He is free to eat at school or bag his lunch, but managing the money, getting it into the lunch account or planning and making lunch is up to him. And if he doesn’t take too many “a la carte” items in the lunch line, the remaining money is his to pocket as well. Like the author, we also had problems getting allowances to the kids and apportioned in a timely manner. Finally, we opened joint checking accounts at our bank and have their allowance auto-deposited in their checking and savings accounts. We sit down each Friday evening and quickly go over their account register to ensure that they maintain the account. Once a month we balance the checking account and update their savings account register. The kids know that, as minors, we are still financially liable for their financial mistakes, so we wrote and signed a contract for debit card use (these accounts have no checks). They were required to make a $64 “overdraft protection deposit” with Mom and Dad before they could use their accounts. An account overdraft will result in confiscation of their card until such time as the debt is paid and the overdraft protection deposit is renewed. If they overdraft a second time, they will lose their card for a year. If there is a third overdraft, they will lose their card permanently. So far, we’ve not had a single overdraft. All in all, it probably doesn’t matter exactly HOW a family distributes and uses allowances. 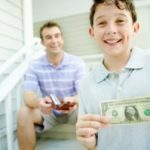 It probably matters more that they do SOMETHING, providing parent and child with the opportunity to teach and discuss financial management and responsibility. Great post. I wrote about this but mine wasn’t as good as yours. Thanks for participating in this week’s very special Memorial Day Edition of the Carnival of Family Life at Colloquium! Stop by and check out some of the other wonderful articles included in this edition! We do something very similar with our kids. Well, kid. The youngest isn’t yet old enough for an allowance. 🙂 We decided on $5.00 per month, per year of age. Our oldest (who is 3), has 3 jars on her dresser. One is marked “spending”, one marked “short-term savings”, and one marked “long-term savings”. Her allowance gets divided into thirds, with 1/3 going into each jar. Even though it would make more financial sense for her to keep her savings in a bank account, I think at this age the concept is so abstract that the jars work better. She can see how much money she is actually accumulating. At some point we’ll take the “long-term savings” jar to the bank and make a deposit. We ask her often what she would like to save up for in her short-term savings jar… the answer changes from month to month, it seems. But the whole point is to teach her to save up for those bigger things she wants. I sure wish someone had taught me those lessons from a young age! We never did allowances when our children were little because we were simply too poor back then. It sounds like a good plan though, wish I could have implemented something like it as it does sound like it would help a child to learn about money. I found your blog through the 153rd Carnival of Personal Finance. Nice to meet you. I’m also curious if you have an issue with chores not being done well. We have a huge issue with 2 of the 3 children working through it as fast as they can and doing what I call a “half-a**” job. The 16-year old isn’t as bad as the 14 year old. All girls, btw. The oldest being almost 18.
nickel.. how do you guys handle report cards? Do you paid for good grades? Currently we don’t have an allowance system setup but we do give then a financial “reward” for their grades and a bonus for making the A or B honor rolls. So far, we haven’t defined the long-term savings beyond saying that it’s for when they’re much older. This is enough to dissuade them from going “all in” as you say. We’re thinking along the lines of a car, college living expenses, or even a nice little chunk of change for when they start on their own. As this money accumulates, we’re also planning on using it to teach them about investing (at an appropriate age, of course). Nice system but I have a question about savings. What is the rule on taking money out of savings? Otherwise they could go “all in” into savings, get their match and then go to the bank and withdraw it. Is savings not touched until they are 18 or something? Financial Goal: That’s why we went from weekly to monthly — to simplify things. Also, the auto-transfer doesn’t really work because the only thing that they have in the banks is their saving. We keep their spending and charity money on hand at home. This is a great system. It does get a little complicated as you could be too busy one week and forget to transfer the allowances. As Michael had stated, having an automatic transfer with ING would be ideal for you. I also love the 401(kid) plan. It gives me some ideas for the future. Dan: Allowance isn’t tied to household chores in our family. The kids help around the house because it’s expected of them as a part of the family. We give them the allowance for a different reason entirely — to teach them about money. While one might argue that this is a problem because they’re getting something for nothing, keep in mind that most people that don’t give an allowance instead just buy stuff for their kids. In our case, the allowance has replaced this, giving them the autonomy to make their own buying decisions when it comes to the hottest new toy, etc. A huge side benefit of this is that the kids no longer whine at us to buy things for them when we’re in the store. That’s what their allowance is for, and they know it. Aryn: To each their own. Yes, it should come from a personal desire to give. But until someone teaches a child what charity is, they won’t know. For what it’s worth, our kids actually really like this setup and, on more than one occasion, they have put extra money into their charity fund. They have the freedom to choose whichever charity they want (though we help them identify a suitable charity based on their desires). They like knowing that they’re helping the environment (The Conservation Fund; our oldest), helping people who have been affected by disasters (American Red Cross; our second oldest) and helping to feed the poor (our local food bank; son #3 and son #4). While I could see this potentially backfiring in some cases, it’s been a totally positive experience for us. I’m going to be a bit controversial here, but I don’t know how I feel about enforced charitable giving. I feel that charity donations should come from a personal desire to give to a cause that matters to you, not because you’re required to give as part of the payment agreement. I do give to charity, and it was never a requirement of my allowance. I wonder if children for whom charitable giving is a requirement eventually learn to resent this piece of “their money” that they never get an option to use. I’ve always admired the discipline of people who dealt with allowances. I tried doing the allowance thing, but really, it’s too much with the 3 kids in the house and the 3 kids that aren’t in the house and the various different expectations. We let them earn money for things we don’t want to do… and we pay for all of their necessities and trips, etc. Maybe I need to free up some time to work on this. Thanks for this timely post! I have been pondering allowances since my oldest turned three a couple months ago so I love finding out what other parents do. 1. If all the accounts are at the same bank, can’t you do an automatic transfer of the allowance money each week or month? 2. I love the 401(kid) program–I plan to do that when my daughter is older. 3. My wife and I just started giving ourselves an allowance, too. Each month, we each get $50 to do whatever we want with. It’s great because we have guilt-free spending money and having it built into the budget, we are spending much less on frivolous things now than before. Obviously our savings goals, etc. are handled outside of this allowance ;).